Michael Malarkey joked he’d like to invite Jeff Goldblum to Mystic Falls to play his dad in season seven of The CW’s The Vampire Diaries. Stranger things have happened on the successful vampire series, but it might be a stretch to think Goldblum would show up for an episode or two. 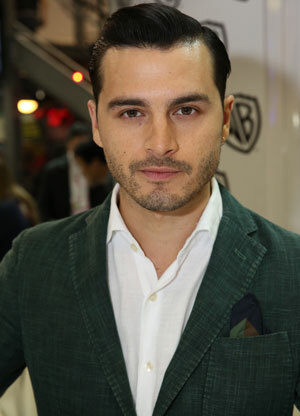 At the 2015 San Diego Comic Con, Malarkey also dropped a few hints about what’s happening with his character, Enzo, in the upcoming season. Season seven will include a time jump and Malarkey thinks that’s a terrific idea. “I think that’s an absolutely brilliant trick because what happens with an audience is when they see that time jump they think, ‘What? How did that character get there?’ And then they start to watch the time real time and start to see what’s going to happen in order to lead to that point. It’s like Memento, the film. And for Enzo apparently is something to do with his love life, that we see him together with somebody – maybe somebody we know on the show. So, yeah, there’s a little spoiler. Everyone wants to know about my love life. I don’t know why. That’s the boring stuff,” said Malarkey, laughing.